“People can be in control of their own recovery; they can learn to control their own body and make themselves better,” said Terry Moore, President and CEO of MMTR Physiotherapy, located in Guelph, ON. His clinic is focused on empowering people with their own health so they can take care of themselves. Moore, a neuromuscular and cardiovascular physiologist, comes from a research background. 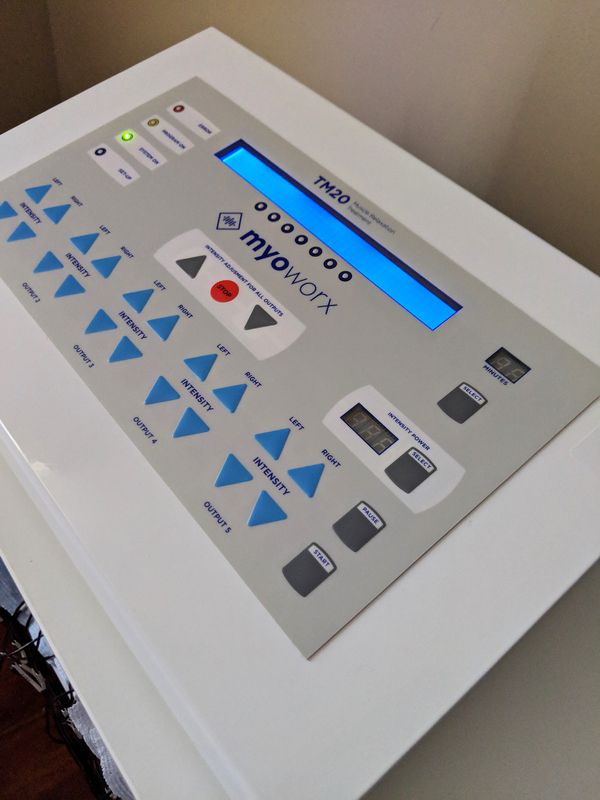 Based on that research and a change in thought process, Moore developed a form of electrotherapy called MyoWorx® that delivers electrical impulses causing the muscles to relax. 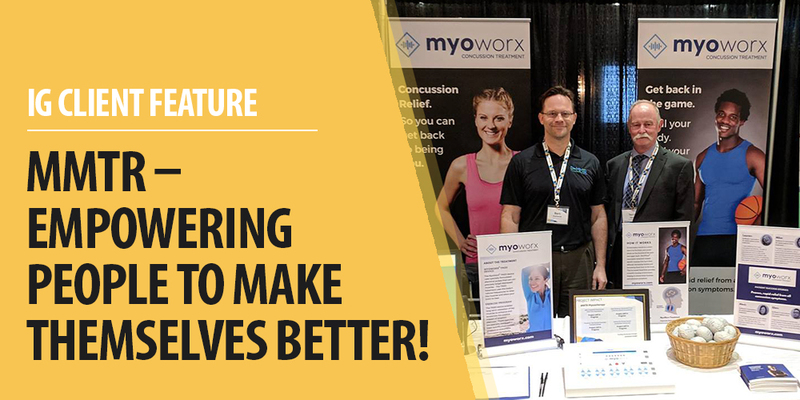 His team includes physiotherapists and kinesiologists who are trained using the MyoWorx® machine and its associated therapeutic model, to teach people how to gradually progress through rehabilitation. After an evaluation by trained physiotherapists, followed by 30 minutes of electrotherapy, patients usually demonstrate improved response to exercise. His treatment methods have allowed Moore and his team to uncover mechanisms related to muscles, nerves, blood flow and autoimmune that were previously unknown. Moore’s therapeutic model addresses the cause of pain. His inspiration is his love of people and helping them enjoy the best life they can possibly have. When asked about the people he can’t help, Moore paused, and with emotion reflected in his eyes, explained that he can’t help everyone and every condition. “Those we couldn’t help have become burned into my mind and caused me to do rethinks,” he said. Concussion is a myriad of symptoms that can be broken down to look at specific causes. Moore added that it’s not common knowledge that specific muscles will cause specific concussion symptoms. Since the neck is the suspension for the brain, the neck muscles are critical. Probably most known for concussion treatment, MMTR sees patients come from all over the world. “Word of mouth is our greatest referral,” Moore said, when people are helped with issues that have been written off by others, they start recognizing conditions in their families that can be treated and they share the information. In addition to concussion, Moore’s team treats many other conditions including arthritis. The trigger for arthritis is often muscles pinching nerves he said. Moore added it might surprise people to know that suffering with dizziness and vision issues can be caused by muscle issues with the neck as well. He has even seen anxiety, depression and irritability respond to specific muscle work and stimulating the right nerves to the brain. The Puslinch resident said his acceptance to graduate school at University of Guelph brought him to this area for his Masters’ and PhD research. Once here, he fell in love with the area and made Puslinch his home. In fact, he later learned both sides of his family had roots in Guelph which made him feel like it was meant-to-be. Living and working in Wellington County has given him the opportunity to live in a community he loves. 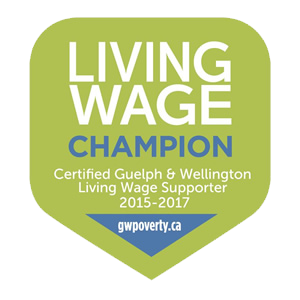 In fact, as a Guelph business owner, he had access to Innovation Guelph. The regional innovation centre provided him with funds and expertise helping him move forward, enhance equipment, complete further research, enhance business skills and meet regulatory requirements for other countries. This enabled him to obtain patents in those countries and to train physiotherapists there to use the MyoWorx® machine and therapeutic model.